As he marches up Fifth Avenue at the head of the Columbus Day Parade on Monday, this years Grand Marshall retired Admiral Edmund P. Giabastiani Jr. as an Italian American who has made a significant contribution and sacrifice to our county reminds us to pause a moment and remember unique and spirited Italians from the past who took to the seas and played an important roll in the history of our city and country. I thought it might be a good time to answer a persistent question that creeps up everytime I drive beneath its towering spires, or turn to glance at its graceful sweeping lines from a car window on the BQE Expressway or an outside deck of the Staten Island Ferry. Who is the man the Verrazano-Narrows bridge is named for? 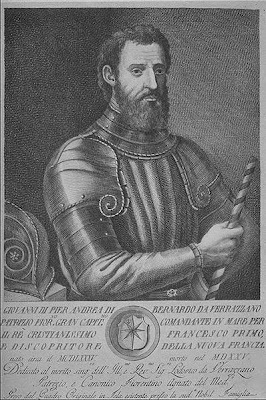 Giovanni da Verrazano like Amerigo Vespucci (whose name was given to the lands Cristoforo Columbo first made known to Europeans) came from the beautiful city on another great river, the Arno...Florence. He is the first European to set eyes on what would become the Hudson River and give names to Block Island and Narragansett Bay. Though Giovanni first sailed into the Upper Harbor in 1524, it was almost a century later in 1609 before the Hudson was fully explored as far north as Albany by Henry Hudson, an Englishman employed by the Dutch. Next time you are downtown in Battery Park look for the monument to Giovanni near the launching site where the boats leave for the Statue of Liberty. After the Parade stop over to Grand Central Station, take a look at the special Columbus Day Exhibit (October 7-17) in Vanderbilt Hall "The Great White Fleet - 100th Anniversary of the US Naval Rescue of the Southern Italian Earthquake." Then for a close-up look at vehicles designed more for flying than driving see the 2009 Maserati's on display in the Main Lobby. Address to Remember: The Parade starts at 44th St. and Fifth Avenue and goes up to 79th St. Get there early (before it begins at 12 PM) and do not forget to bring flags. Directions: From Times Square MTA 7 or S to Grand Central Station, short walk west to Fifth Avenue.